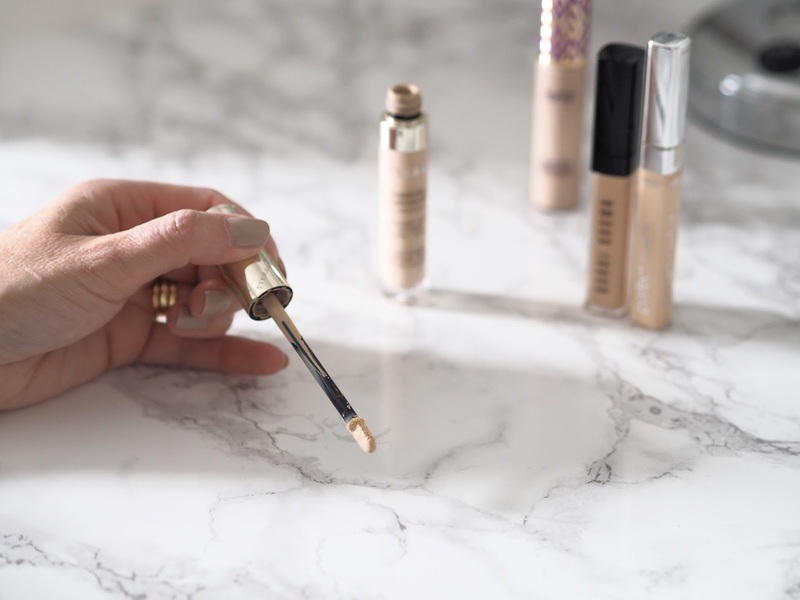 I've struggled for a little while finding the right concealer for my skin, it's like chasing that perfect foundation, most of them are just too drying, especially around my eyes and end up sitting in my creases making me look 100 years old! None of us want that do we ladies?! 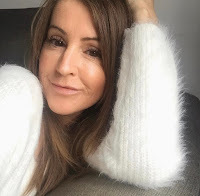 When you get to a certain age you've got a little more to conceal than the youngsters, you know, lines, wrinkles, dark circles, age spots, pigmentation, the list goes on. There are so many concealers out there, it's a tad confusing, and bloody expensive when you keep buying them only to find that, nope, that one's not suitable either and in the drawer it goes along with all the others. 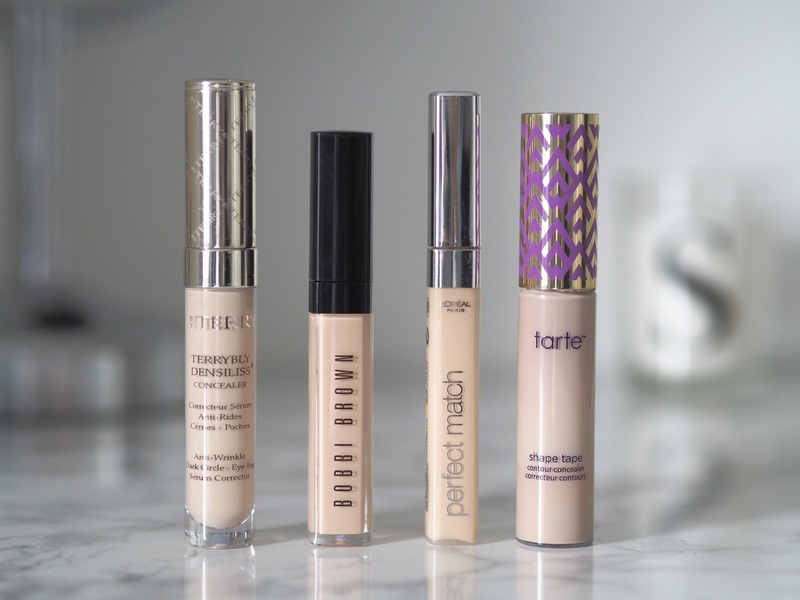 So, I thought I'd tell you about the four that I use kind of on rotation, depending on how my skin looks when I look in the mirror each morning! I'll start with this one as it's the first one I bought out of the four. It's more specifically for the eye area and is a bit of a cult product. The Densiliss is highly concentrated and acts more like a serum, providing immediate and long term skincare results. It has FTC, flawless time control, which is a soft focus prism complex for optimal anti-ageing. There's a mouthful!! This goes on beautifully, like a second skin and leaves a matte finish, long lasting coverage and it doesn't sit in your lines. You can see the applicator in the shot below, it's soft and quite flexible which I like for around the eye area as it doesn't drag the skin. This one however is the most expensive of the bunch. It's got literally thousands of fabulous reviews and this is in fact the second one I've purchased. You can find details here. I have the shade vanilla beige. I'd heard so much good stuff about this one, beauty bloggers rave about it and how they can't live without it so I had to see what all the fuss was about! This is a 'contour concealer', full coverage and blendable. It claims to highlight and cover dark circles without any flaking or creasing even if you have dry skin. I was so excited when this came in the post, but I have to say it's been a bit of a let down for me. I just find it's just too drying under my eyes, even though I've used a top quality moisturiser first, for me it actually highlights the wrinkles even more and that's what we don't want! It's good for covering dark circles and it does brighten the eye area but it's just not working for me. So, as an under eye concealer it gets a thumbs down but as a facial concealer, covering spots and blemishes it's great. I just use this now to cover blemishes and some dark sun spots on my cheeks and it does cover them brilliantly, so for that it gets the thumbs up and the reason I've included it in this roundup. Also, a little goes such a long way with this product, you really do only need a small amount. I have to say there's something else I don't like about shape tape, sorry, and that's the applicator. It's way too big for my liking and it tends to get all gunky and horrible around the top of the bottle. Not great. More info here. I have this in shade light. 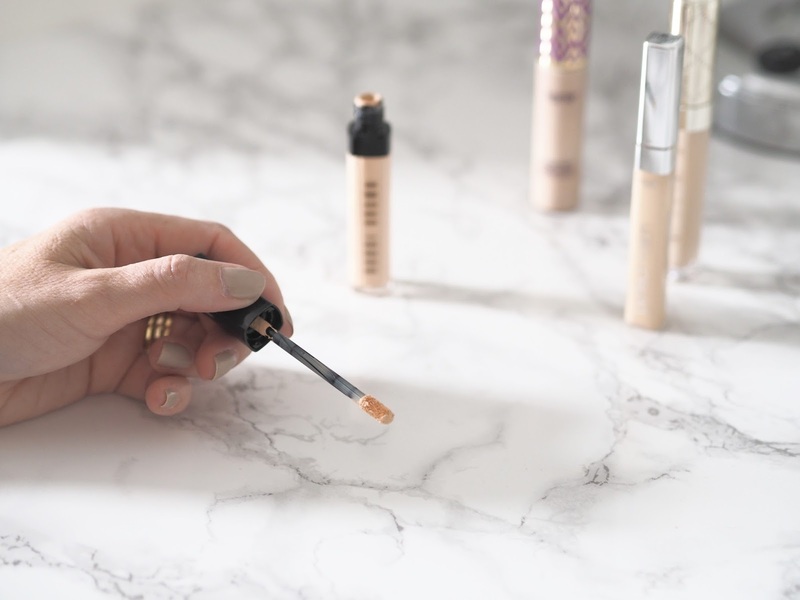 This is a concentrated, highly pigmented concealer that visibly brightens under the eye, helping with those pesky dark circles, softening hollows and tired lines, hands up if you have all of those? 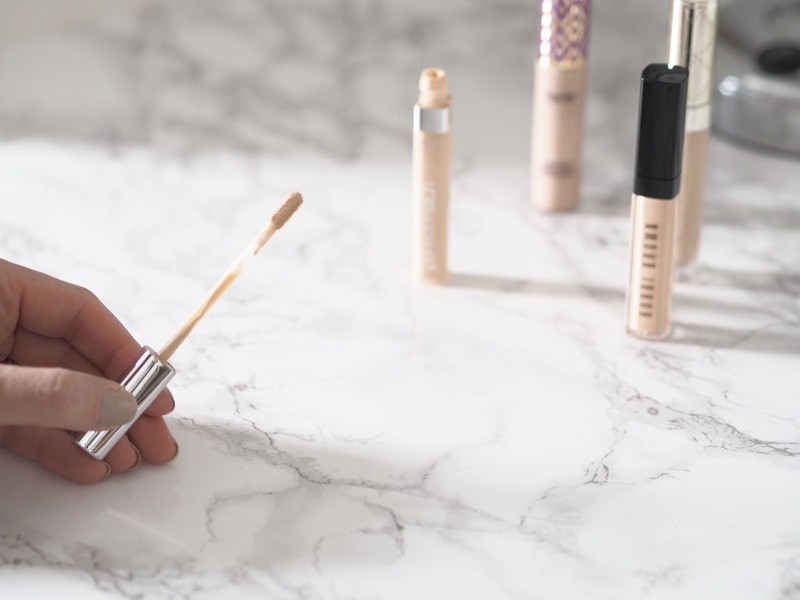 It has a long wear formula that is water, sweat, and humidity resistant with all day coverage that won't crease or settle. The formulation of this one is quite thick so don't drag the applicator across the skin, just dab on 3 or 4 tiny dots, you don't need a lot, and then pat and blend with your ring finger. It soon warms and melts into the skin. I sometimes put a little onto the back of my hand so it warms, then I'll apply. I really like this one as it's not drying at all, it's not matte and leaves quite a dewy finish which I like. I have shade warm ivory. Shop it here. I left this one till last because I bought it last but let me tell you I bloody LOVE this. I think I first saw this on Lydia Millen's insta stories and she was showing how she used it to not only conceal but highlight too. It's enriched with caffeine to instantly brighten the eye area and help cover dark circles. 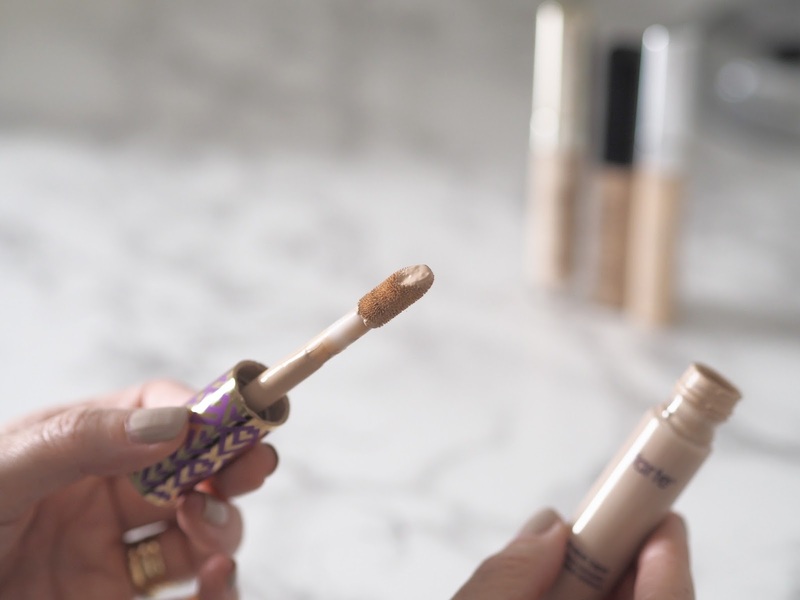 This is not a full coverage concealer by any means though, it's more of a medium coverage but you can build the cover really easily because it's so beautifully lightweight, I mean seriously lightweight, you don't feel like you're wearing it. This one doesn't have the longevity like the Bobbi Brown one, but that doesn't bother me, I like to touch up throughout the day anyway, more so when I'm at work and it's no problem with this, as it doesn't cake or look dry at all. I adore how this makes my under eye area, bright and less tired looking, and it leaves the loveliest dewy sheen on my skin. I use this one under my eyes, around my nose, forehead, chin and under brows, practically everywhere. This is hands down my favourite!!! I have shade Ivory (1N). It's my favourite and also the cheapest of the lot, which is a good job as I'm getting through shed loads of the stuff!! Details right here. So, I think you've gathered that the one from L'Oreal is my favourite, with Bobbi Brown coming in second, By Terry third and Tarte coming in last. I've realised I'm drawn to the more dewy products rather than matte, that's why I prefer my top two. As far as applying goes, I don't draw on those big under eye triangles of product, like the MUA's tell you to do as on more mature skin I believe less is more, you really don't want to be piling it on, go in with a light hand, you can always add more. Now, although none of these sit in the lines badly, just after I've applied, I find they all sit in the crease close to the inner corner of the eye, but just give it a minute or two, let it warm, blend it outwards, then you're good to go. I don't set with any form of powder around the eye either. 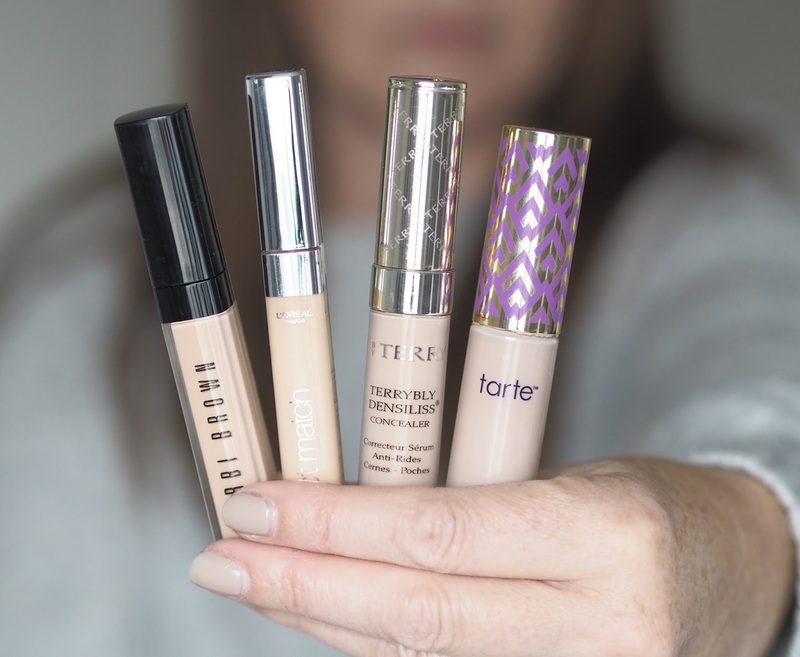 I hope this post has helped a little if you're after a concealer for yourself, BUT if you're reading this and have another you think I'd like please let me know. Us woman are always on the lookout for the next best thing aren't we?! Have you tried any of these? Don't forget to send suggestions! Oohhh - I’m currently on the lookout for a new concealer that doesn’t sit in the eye crinkles!! I’ll def give the L’Oreal one a whirl as a starting point! Ooo I like the sound of the Bobbi Brown and L'oreal ones. Will look out for them when I'm out and about tomorrow. Now it's getting cooler here my makeups starting to come out haha. But I NEED help with my ever appearing wrinkles and dark circles!! I absolutely love the Shape Tape, but want to try the By Terry!